The main reason it is in your best interest to integrate your ERP application (which manages finance, inventory and receivables, etc.) with your CRM application (which manages relationships, support, upsells, etc.) is that it will significantly improve your ROI on both investments. At a high level, CRM and ERP integration will eliminate any “swivel-chair” data entry, and as a result, will automate everyday business processes, increase the accuracy of your data and provide a better view into your customer base. Contact & Account Integration - The CRM and ERP system both contain contact and account information, with ERP focused on billing and shipping addresses and the CRM focused on prospects and sales/support. Your integration between these systems must address these various business rules for each system, while supporting ongoing changes custom fields on these objects at the same time. Product Integration. The CRM application will need to provide access to any products that are contained in the ERP if true process integration is going to be created. For example: allowing sales people to view and/or order from bills of materials. Product/Order/Invoice Repository. 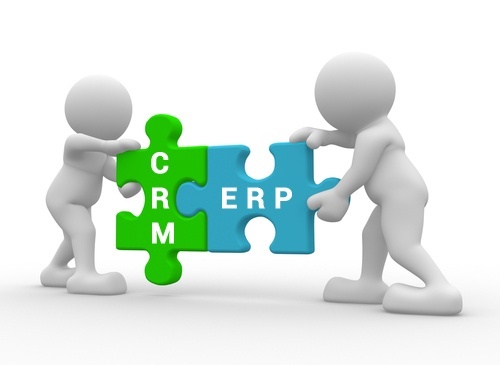 A necessary function of the CRM/ERP integration is the ability to provide your sales reps with visibility of the status of the order, as well creating and tracking changes. When considering what a lack of integration would do to your every day business processes, it makes sense to integrate your systems. For example, if you’re a manufacturer whose accounting functions are handled in your ERP application and your sales team currently tracks their opportunities and wins in the CRM system. Without having your systems integrated, these orders are manually entered into the ERP financials module, leaving room for errors. Equation Technologies is a certified Sage partner and specializes in Sage 300 ERP and Sage CRM. For more information or for help integrating Sage 300 ERP and Sage CRM, contact Equation Technologies today.